Ocean View homes in Dana Point are found in most regions in Dana Point. Communities located in Monarch Beach area of Dana Point will be the most expensive with multi million dollar homes with views of the Pacific Ocean. Less expensive view homes can be found in the Lantern Village, Dana Hills and Capistrano Beach areas. The most expensive ocean view homes are located in the brand new community known as "The Strand at Headlands" which features beach front and ocean close homes that average over 8,000 square feet of living space and can be priced as high as twenty five million. A close second would be the Monarch Bay and Ritz Cove neighborhoods which are located near the Ritz Carlton and St. Regis hotels and are considered ocean front communities. Home prices will range between five to twenty million with some spectualar ocean and golf front estates. Dana Point is also home to beach front homes located on the sand and can be found in the "Beach Road" community. Owners own a piece of the sandy beach and are just steps to water. Home prices in this neighborhood will start in the mid three million dollar range and go as high as ten million dollars. More affordable ocean view communities like Waterford Pointe, Seabourne, Antigua and Niguel Shores will offer ocean view homes priced under one million in a secure gated neighborhood. 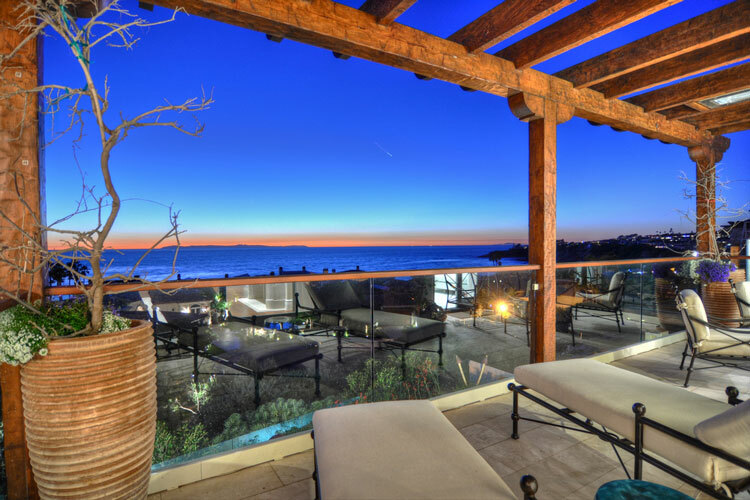 All the current available ocean view homes for sale and ocean view homes for lease are listed below. Please contact us a 949-606-4114 with questions regarding any of these properties.